Central Atlanta Progress and the Atlanta Downtown Improvement District (CAP/ADID) are leading the Auburn Avenue Historic and Cultural Information Project, which includes two major components. 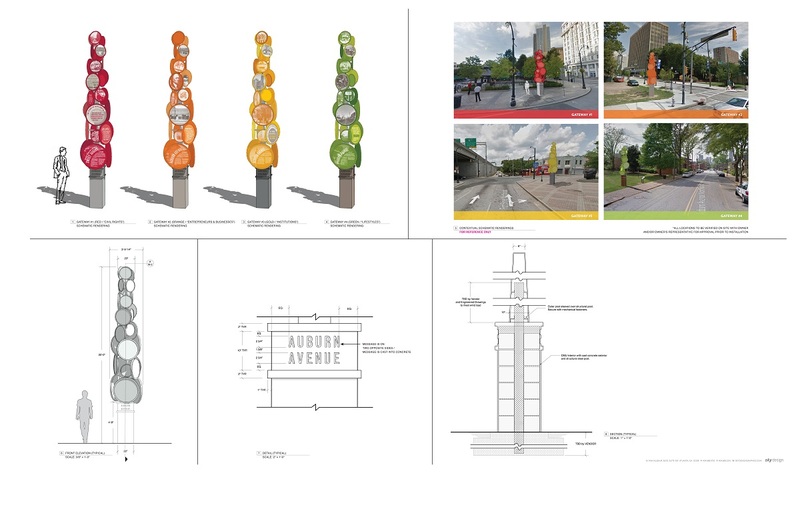 The first aspect is the installation of (21) new interpretive and (4) gateway signs along Auburn Avenue between Peachtree Street and Old Wheat Street. The second project element is a large scale (270’ W x 22’ H) mural enhancement to the existing bridge underpass at Auburn Avenue and Interstate 75/85. The project, made possible by Transportation Enhancement (TE) funding from the Georgia Department of Transportation (GDOT) and funding from CAP/ADID, is intended to improve the aesthetic quality of the existing bridge infrastructure and improve the pedestrian experience, all while reflecting the history and culture of the surrounding community. The signs will replace existing interpretive signs installed by the Corporation of Olympic Development in Atlanta (CODA) in 1995. The mural enhancement will feature large scale images of historic buildings, landmarks, and cultural institutions which exist or previously existed along Auburn Ave. The project, made possible by Transportation Enhancement (TE) funding from the Georgia Department of Transportation (GDOT) and funding from CAP/ADID is intended to improve the aesthetic quality of the existing bridge infrastructure and improve the pedestrian experience, akk while reflecting the history and culture of the surrounding community. Fabrication of the mural and sign components is underway, and field work will be visible in the months of April and May. Most work will be done at night to maintain daily Atlanta Streetcar operations. Substantial completion of the project is scheduled for Summer 2019. For additional information about this project, contact Wesley Brown at wbrown at atlantadowntown.com or (404) 658-5983.